One of my favorite things here at DVDSleuth.com is the frequently visited "I've heard of these people, why haven't I heard of this movie?" segment, which focuses on obscure movies starring (at least) semi-famous people. So, I'm very excited to present a spin-off of that feature, which we are calling, "I've heard of the parents of these people, why haven't I heard of this movie?" This is very similar to the first offering, except it stars the offspring of famous actors. I have to admit, this may be a narrow category, but it could be fun. We kick this off with Enter Nowhere. Enter Nowhere opens with a Pulp Fiction-esque scene in which young couple Jody (Sara Paxton) and Kevin (Christopher Denham) rob a convenience store, which concludes with Jody threatening the clerk (Jesse Perez) at gunpoint. The scene then shifts to a forest, where Samantha (Katherine Waterston) is seeking shelter. She finds a cabin, and soon meets Tom (Scott Eastwood). Samantha explains that she had been traveling with her husband and they'd run out of gas. When she went to look for help, she'd gotten lost. Tom is in a similar predicament, having wrecked his jeep. Tom states that he has scouted the area around the cabin, but there doesn't seem to be any help nearby. As the two discuss possible options for this situation, Jody appears on the doorstep, unconscious. Upon awakening, she lets them know that Kevin had abandoned her and she didn't know how she got to the cabin. As the three compare stories, they begin to find similarities, however, this doesn't explain how they got to this isolated place, and how they will survive without much food or water. 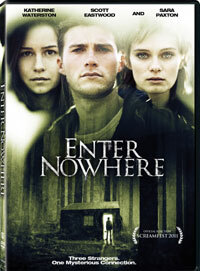 Enter Nowhere is a nice example of what can be done on a limited budget with a small cast and minimal locations. The film opens on very familiar territory. Again, the Pulp Fiction inspired opening suddenly jumps to a very Twilight Zone-esque plot which we've seen many times before. A (very small) group of strangers find themselves in a strange place having no idea how they got there. They try to escape and find that all routes lead them right back to the cabin. (How many times have we seen that before?) At the mid-point in the film, we've got this all figured out having seen this story in the past. But, that's when co-writers Shawn Christensen and Jason Dolan bring in a twist which is rather unique for this genre. Granted, it's sort of an odd twist, but it does take the story in an original direction, making for a second-half which raises a new set of mysteries. The only real issues with the script is the wrap-around story which explains why what is happening is happening. Some viewers won't buy it and will throw their hands up in disgust. Fortunately for Enter Nowhere there is some good talent involved in the film. Scott Eastwood, son of Clint, proves that not only are there some strong genes in the family (he looks just like his dad when he was young), but that he has the chops to be a leading man. However, unlike his famous father, he plays things more loosely and I could easily see him doing comedy. Katherine Waterston, son of Sam (wow, that doesn't look good in print), brings a certain poise to the uptight and confused Samantha. Sara Paxton plays somewhat against type as the tough and angry Jody, and she's pretty believable in the role. First time director Jake Heller stages the action scenes in a nice manner, but the pacing gets away from him in the third act. The audience should never be hoping for a movie to wrap things up. Enter Nowhere was one of those nice "pleasant surprise" movies. I knew nothing about the movie, and let's face it, Lionsgate doesn't exactly have the best track record with their low-budget acquisitions. But like 2003's Dead End or the recent Seconds Apart, they occasionally unearth a winner. The movie is far from perfect, but it gets points for taking a familiar story in a new direction and relying on suspense and performances, as opposed to unnecessary violence or trickery. Playing like a combination of Back to the Future, Jacob's Ladder, and Dean Koontz's Strangers, but not actually resembling any of those titles, Enter Nowhere offers just enough originality to make it worth recommending. Enter Nowhere gets a special nod for using a piece of wood to plant a red herring on DVD courtesy of Lionsgate. The film has been letterboxed at 2.35:1 and the transfer is enhanced for 16 x 9 TVs. The image is sharp and clear, showing no intrusive grain and no defects from the source material. The colors look good and the image is never overly dark or bright. For a DVD, the depth is good and really stands out in the shots showing someone in the distance in the forest. The level of detail is adequate. The DVD carries a Dolby Digital 5.1 audio track which provides clear dialogue and sound effects. The surround sound effects stand out here, most notably when gunshots are heard outside of the cabin. We also get some nicely detailed stereo effects. Subwoofer effects don't come into play until the finale and they sound fine. The Enter Nowhere DVD contains only two extras. "Enter at Your Own Risk: Behind the Scenes of Enter Nowhere" (14 minutes) contains comments from the filmmakers and cast, as well as a wealth of on-set footage. Director Jack Heller provides a nice amount of details on how the project came together and the casting process. From there, the actors talk about their characters and Heller describes the production. The only other extra is a TRAILER for the film.